Water has been pouring from the sky for days now. The garden is flooded, the forest is flooded, and the seas are high and rough. Everything is getting a thorough soaking and it’s wonderful. Everything is just soaking it up, the plants and the earth. All the animals are sheltering in their favourite places and people are indoors doing indoor things until the sun shines again, as it always does. Today is the day I do my shopping, basically because I live forty kilometres from the nearest shopping centre that has what I want. That’s an eighty kilometre round trip and the cost of fuel has gone up dramatically recently so I keep my use of the car to a minimum. Driving along in the rain is almost blinding at times. Even on high speed the wipers only give me a clear view for a couple seconds at a time and then it’s a blur for a few seconds. Could be dangerous. But I love driving through the water and feel the tyres hit the resistance, hear the water spray up into the car and clean it underneath, and see the spray, whoosh, on either side of me. Great fun. The only animals I’ve seen outdoors the last couple days are the birds, the ones with young to feed. 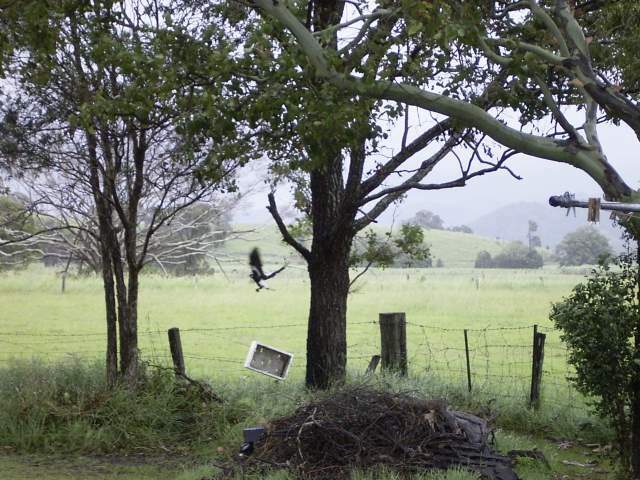 Today I heard the urgent cries of the young butcherbird and went out to have a look. 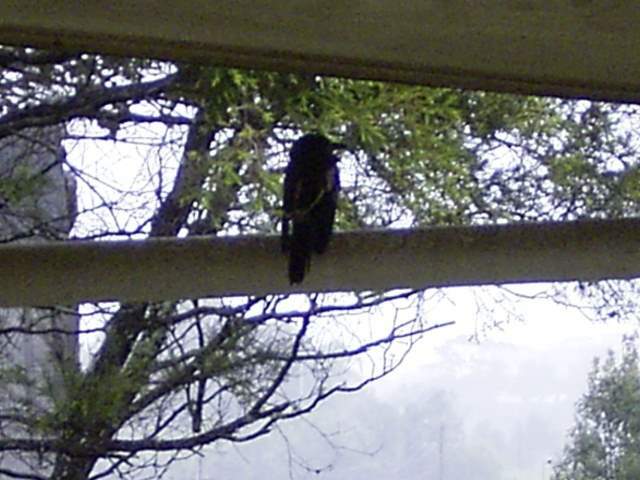 There it was on the drainpipe under the eave of the roof, looking sodden from the rain. The parent was on the clothes line and when I appeared to get too close to the young one it called to him and flew away and the young one followed. Some of the birds are having a rough time of it in the strong winds. I’ve seen them blown wildly about, but it is their element after all isn’t it. Is a maggie dodging branches as it is blown between two trees in the back garden down past the water tanks, that box was blown in from I don’t know where. When the weather is really too rough they know better than to fly. Some don’t though, whether because of experience or the lack of it, or hunger drives them – birds don’t carry much in the way of energy reserves. Or one could risk it and go out hunting while it’s calm because there are young to be fed, and then have to find its way back to the nest after the weather darkens again. It’s dangerous weather for birds, not being able to fly safely. And with cats, dogs and snakes about it’s a dangerous time for them indeed. Because flying is their only escape from any of these animals. The other creatures that love this rainy windy weather are the frogs. You can tell they just love the rain the way they sit there soaking it up, contented creatures. The rain helps frogs in other ways than the essential but simple need of water. They can travel more easily in the fluid of the rain, which means they can travel further so they can spread out and so increase their long term chances of survival. 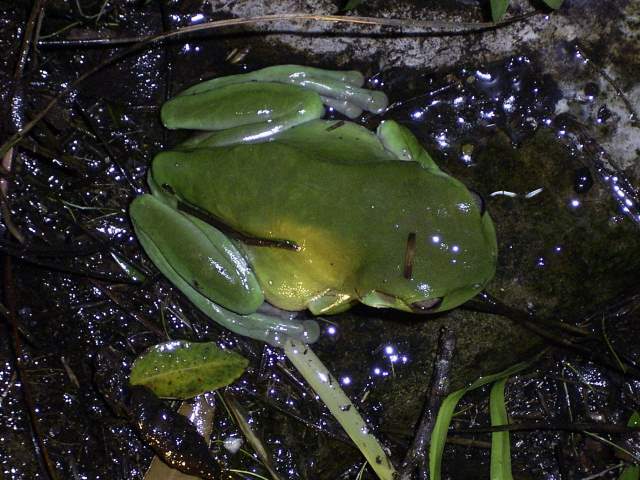 The rain also provides all other creatures with similar opportunities and more insect’s means more food to the frog. Great news, for the frog. But after all the rain we’ve been having I’d say even the frogs are under shelter. I love the sound of the rain on the surfaces of the house, mostly on the roof here since there is a veranda around the house. The sound of rain on the roof as it falls in differing volumes and at different intensities blown by a fickle and sometimes steady wind reminds me of the simple sensation in the body. That tingling I see and feel inside when I’ve closed my eyes and my mind is quiet. Seen all the easier when I’m sitting in the dark just listening, listening in the silence of the night, of inside. 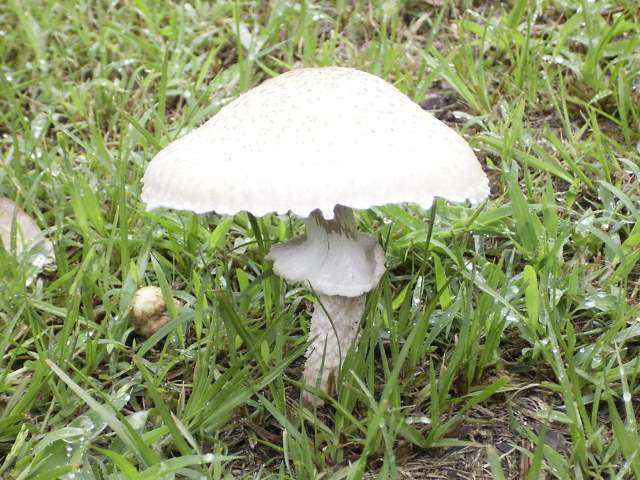 And by the looks of it there will be fresh mushrooms for dinner tomorrow. Yum! Another gift of the rain and the earth. 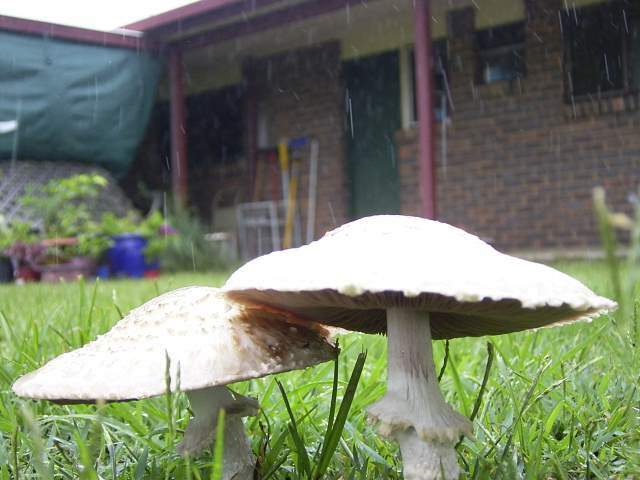 After any significant rain mushrooms appear in the back garden, usually enough for a meal or two. And they’re free.